handspun polwarth wool, 4 ozs. Pattern does not specify yarn, gauge or number of stitches used. The designer used her own handspun Polwarth wool, from 4-5 ozs. for the two shawls pictured. 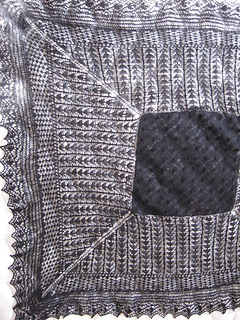 This design is more of a recipe for a square lace shawl than a true pattern.